Cetinje Historic Core is part of the Tentative list of Montenegro in order to qualify for inclusion in the World Heritage List. Cetinje was the Royal Capital of Montenegro from the 15th century until Montenegro's incorporation in Yugoslavia after WWII. It is considered both a cradle of Montenegrin culture and a Serbian Orthodox religious center. 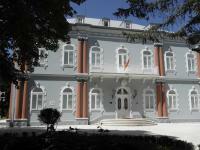 The official residence of the Montenegrin President is also here (see photo). I visited Cetinje on my way between Podgorica and Kotor. Buses between the two cities will stop here, so it's an easy break. I walked around town for 1.5 hours, and was really surprised about the good state of most of the monuments. Especially the villas and old embassies are worth seeing. The town has a Central European atmosphere, a bit like Kutna Hora or Cesky Krumlov in the Czech Republic. Most people come to see the Cetinje Monastery, which is the seat of the highest / largest diocese of the Serbian Orthodox Church in Montenegro. Its church holds an important relic: the right hand of Saint John the Baptist! Maybe it fits the part of the arm that is kept in Valetta, Malta. I did not see it, as I would have to wait with dozens of other foreign tourists in the inner courtyard for a group visit to start. I don't like to be treated as a sheep, so I just walked on. I am not aware that the Montenegrin government is preparing any WH nominations, besides taking part in the transboundary Stecak/Stecci nomination (which in essence is Bosnian history). But from the current Tentative List Cetinje must be the most promising candidate. It profits already from its position close to the beach town of Budva, and many tour buses visit the site daily.